In my time in India, I’ve been mistaken for a lot of things. There was a time when someone mistook me for a cab driver (that didn’t end well as the police gave me a ticket, long story), then there was the time I was mistaken for a laundry walla (the guy that picks up dirty laundry from homes and returns them cleaned), there was a time when I was mistaken for a prominent doctor (that didn’t end well either, I ended up having to run away from the scene, again, long story). I guess you can say I’m like that character; Leonardo DiCaprio plays in Catch Me if You Can, perhaps not as good looking, unless you ask my Mom. Two weeks ago, I was again mistaken for someone else, but for the first time it ended well. Let me explain. One of my favorite events here at BTC are weddings, it usually doesn’t have the gallantry and extravagance of weddings in the West but it is no less magical. Two weeks ago, we made our drive over to a city two hours away for one of these weddings. My wife, Leena and our two older boys went and sat towards the front and I was in the back with our youngest guy, Daniel, prepping him to make his inaugural walk down the aisle as the ring boy. Whenever we need Daniel to do something he doesn’t like, Leena assigns the task over to me because she says I’m better at it. The truth is the kid is incredibly cute and also greedy and I end up having to pay dearly to get him to do what I want him to do. So, here I was, focused on having him accomplish his task. And he was continuing to remind me that I had promised to drive straight to the toy store the next day to get his mini basketball and hoop. As I was focused on him, I could hear in the background some slightly frenzied activity. 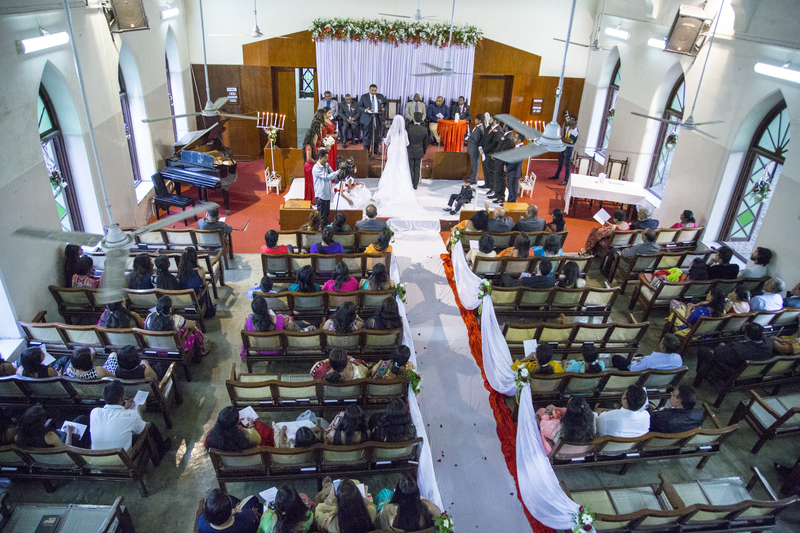 When I turned to see what was happening, I saw one of the wedding coordinators asking where the pastor from BTC was and then I saw my boss, the founder of BTC, Devaraj with a sly grin pointing to me and saying, ‘there he is”. Without having time to object, the coordinator came to me and said to follow him quickly, that the ceremony was about to begin. I followed him in confusion and came to the front of the church right behind the altar. There, the senior pastor told me that I would be marching out second and gave me the Bible portion I would be reading. And before I knew it, I was at the Altar looking towards the crowd. And as I spanned the audience, I could see my two older guys looking amused and Leena with her eyes covered. To make matters worse, I had not listened to my Leena’s pleas before we left to wear a suit. I had told her that it was too hot and no one would notice so I wore a rather casual Indian top (a kurta to be specific). It was pretty hard not to be noticed now, five distinguished pastors in suits and me. So, one could conclude that this can be chalked up as another bad turnout. But what I got to see is a memory that I will cherish for a long time. 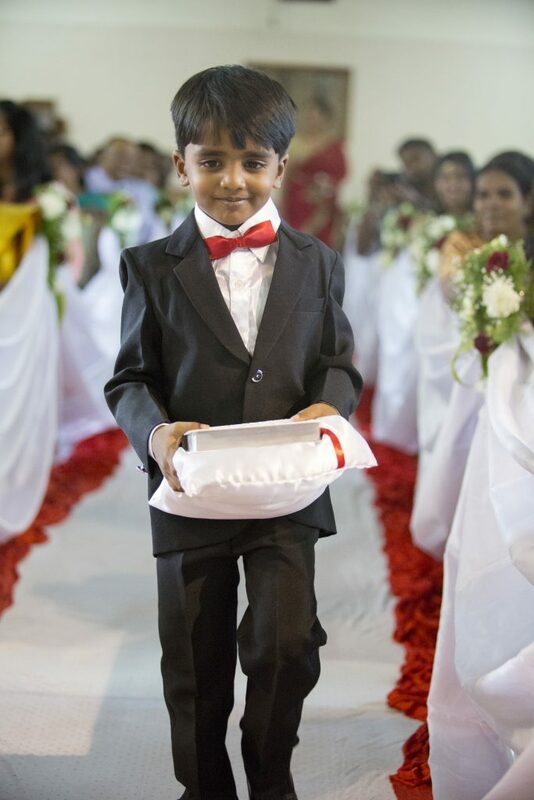 The music began and there walked down my little one, handsome and confident, and then walked down the two precious flower girls, both of whom are part of the BTC family and are students at the Academy. The pretty bridesmaids followed them and then the music stopped and the bridal march began. The doors opened and there was my boss, Devaraj, in his role as the father of the bride, arms locked with this beautiful bride. Her smile, radiant and unchanged from that when she was a little girl. As they slowly walked down the aisle, I couldn’t help but think so many thoughts. Some eighteen years ago, Devaraj had wiped the tears from this young little girl and brought her to the BTC home. Did he ever think then that one day, he would be bringing her over to her groom and a loving family that was excited to call her daughter? I thought of this beautiful bride who as a young girl looked out into a scary and unknown future, mustered up the courage she needed and told Devaraj that Jesus would take care of her. And I looked over at this young man, determined to make a future that will be filled with love and hope for the both of them. And I couldn’t help but look over at the parents of the groom, watching on with nothing but joy and pride. My eyes came back to the Father and the Bride as they came to the front and Devaraj handed over the bride to an eager and waiting groom. And I got a front row view to all of it. Sometimes, it ends pretty well.